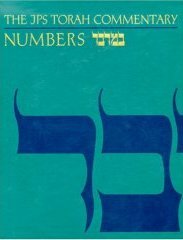 The fourth volume in the fine set of Torah commentaries produced in the 1990s by the Jewish Publication Society. As with the other volumes in the set, the full Hebrew text is given, together with the new JPS translation and extensive notes and commentary by an expert commentator, paying attention to both critical scholarship and traditional sources. There are many notes to the commentary and a collection of essays upon some of the more interesting points. Well worth owning, we recommend these commentaries to all serious students.